The whole concept of business has changed a lot in last decade. People are now using online resources for buying products and services which has forced businesses to change their strategies and adapt according to the present market requirements. Today, there are millions of websites that are selling products and services over internet. To make yourself visible in such a tough competitive environment you need to make yourself different from others. 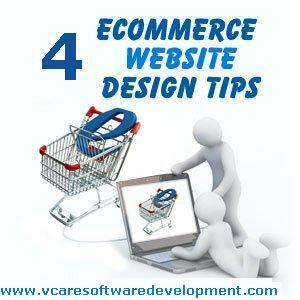 Here are 4 web designing tips that could help e-commerce websites in enhancing their business by increasing their sales. The Shopping Cart Should Be Always Visible: Make sure that the shopping cart on your website is always visible to the visitors. If the user has selected any item then he should be able to view this selection in the cart at all the times somewhere on the website. No matter where the user stops shopping, there should always be a clear sign of cart from where he could checkout. The “add to cart” Button: The “add to cart button” also has a lot of impact on the online shoppers. Using indirect words such as “know more” or “view details” could have a negative impact on them. Whereas sticking to “Add to Cart” usually turns out in a much positive way. Further, using green or blue color buttons also has a positive impact on the shoppers. Enhance Your Product Pages: The way you arrange your product pages and present them to your visitors also has a lot of effect on them. The first thing that your visitors should see is the image of the product followed by the details. The reviews are also important but they should be kept in the lower section of the page. Further, make sure that you use high quality pictures that could easily attract visitors. Make Navigation Easy and Simple: The navigation is also an important part of website designing and web development. Avoid using any hidden elements in the navigation as they can very easily frustrate visitors and make them go away. Try to keep the navigation as simple and easy as possible. E-commerce websites should give proper attention to their website design as it is the main source of their business and it is important that they are able to attract as many visitors on their website as possible. If you have any questions or want to share your thoughts on website designing and web development then please leave us a comment below.